Dreams hold much more mystery than you think. You may think dreams are just hallucinations but it is impossible to fathom what’s going on in your brain even when you’re sleeping. Here are 25 mind boggling facts about dreams that are so trippy, they might just freak you out. 1. You cannot read in dreams. So, the next time you’re wondering whether you’re dreaming or not, try to make yourself read something and you’ll know! You cannot even read time from a clock or watch in your dream. 2. People say if you die in your dream, you die in real. But that’s just a myth. You can die in your dream and wake up to share your experience! 3. Studies suggest that it is not possible to snore and dream at the same time. 4. Even blind people dream. People who are blind by birth cannot see images in their dreams, but their dreams are governed by sense of smell, sound and obviously, emotion. People who go blind after birth can still see images in their dreams. 5. A lot of people claim that they don’t dream. But that’s untrue. Everybody dreams. But, 60 per cent people forget their dreams completely. 6. Our brains are more active when we’re asleep. So, your brain is constantly working even when you’re dreaming. 7. Negative dreams are more common than positive ones. Most people dream about emotions like anger, fear, sadness or anxiety! 9. All the faces you see in your dreams are faces you’ve seen before, consciously or subconsciously. 10. A normal person forgets 90 per cent of the dreams he sees. 11. Everybody doesn’t dream in colour. 12. Studies suggest that men’s dreams are more aggressive in nature than women’s. 13. With practice, it is possible to control your dreams. It is called lucid dreaming. 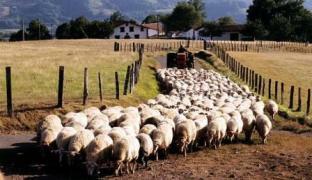 It lets you steer your dream whichever way you like. You can fly, pass through walls and do what you want! 14. There is something called a dream drug. It is a hallucinogenic drug known as Dimethyltryptamine. It helps you dream whenever you want, wherever you are, even during the day. The drug is illegal. 15. A lot of people have multiple dreams in a single night – about 4 to 7. 16. Premonition dreams is a phenomenon where things happen in real life exactly as you already saw them in a dream earlier. Now, there can be no surety as to whether it is just a coincidence or the dream was actually a glimpse into the future, but there have been some astounding examples that hint at the latter. Abraham Lincoln was said to have dreamt of his assassination, some 9/11 victims had dreamt of the event beforehand. 17. Usually, women see men and women in their dreams in equal amounts, whereas men usually see more men than women in their dreams. 18. An external stimulus can affect your dream. You might just dream of a concert if there’s music playing around you while you’re dreaming. 19. You usually remember only those dreams that you wake up in the middle of. Our brain starts erasing the dreams from our memories automatically once they’ve ended. 20. Sleepwalking is much more serious than it sounds. A sleepwalker can do anything under the influence of his/her state. Nurse Lee Hadwin turns an artist when he sleepwalks and creates brilliant portraits that he doesn’t even remember painting the next day, a woman was reported to have driven for 22 miles while sleepwalking only to kill her cousin – these are some of the creepiest instances of sleepwalking ever reported. 21. The biggest nightmare you can ever get is sleep paralysis. If you suffer from sleep paralysis, you feel unable to move, speak or react at all in your dream. It triggers anxiety, fear and terror. 22. Dreams are also said to boost your creativity. Some of the most notable inventions in the world have been conceived while dreaming. Elias Howe invented the sewing machine, Tesla invented alternating current generator, James Watson discovered DNA’s double helix spiral form and Dimitri Mendeleyev coined the Periodic table inspired by what they saw in their dreams. 23. An average human would have spent approximately 6 hours of his life dreaming. 24. A person who is trying to quit smoking gets longer and more intense dreams. 25. 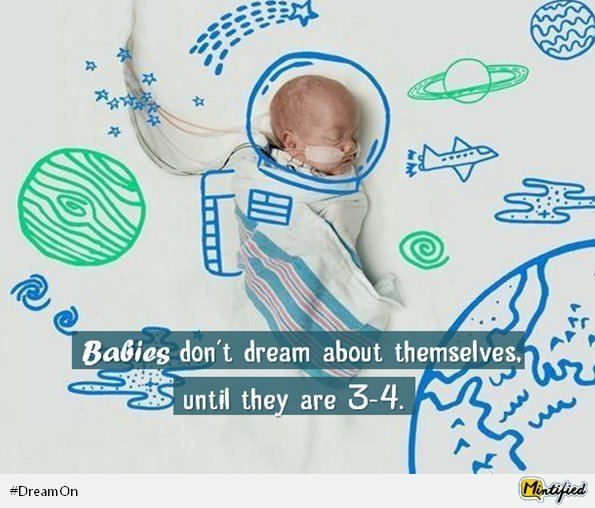 Babies cannot dream of themselves till they are 3-4 years old.